Just when you begin to feel a little sad that many people are not responding to your letters, you get a personal response from a great man. 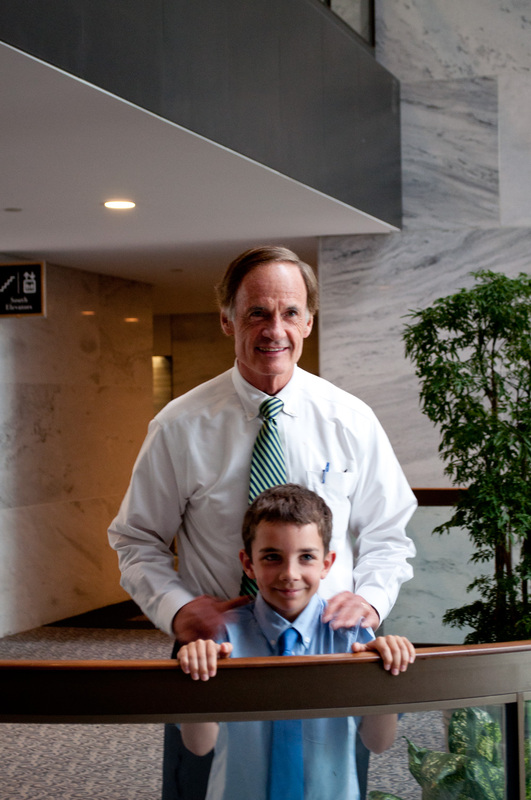 I met Senator Carper in July after winning the 2013 Healthy Lunchtime Challenge and I really liked him. He seemed pretty cool. He does a lot to help people and he does a lot for Delaware. He wrote me back and it made me feel really good so I wanted to share it with you. Many thanks to Senator Carper for personally responding to me about my 3B project! You should check it out and read what Senator Carper thinks are the “four keys to success” because he is very smart and what he says makes a lot of sense. I hope he knows that I think 3B is right and that I will never give up either! Thank you for contacting me to share your efforts to increase access to healthy foods in Delaware. I was honored to meet you in July during your visit to Washington DC, and I appreciate you telling me more about your latest project, Brae’s Brown Bags. Let me begin by saying that I am encouraged to hear from a young person who is passionate about addressing hunger in our community. As you may know, over 800 million people across the world are hungry, including an estimated 35 million Americans who struggle every day to put food on the table. One of the major challenges that we face, particularly in urban centers, is access to local, healthy foods. Having worked closely with the Food Bank of Delaware over the years, I certainly understand the importance of providing reasonable levels of funding for federal nutrition programs, which have proven to be vital lifelines for millions of low-income individuals and families. During my tenure in the U.S. Senate, I have consistently advocated for healthy eating habits and regular exercise. We should be doing all we can to support access to healthy foods and encourage people to eat more healthful foods as part of their daily diets. I am impressed with the success of the 3B program. By packing brown bags full of healthy snacks and bottled water and handing them out of the neediest in the community, you are truly serving ‘the least of these’ in our state. During my tenure in public service, I have always sought to fulfill my four guiding principles on behalf of the people of Delaware. I call them the four keys to success. First, I ask myself, “What is the right thing to do?” Not “what is the easy thing to do” or the “expedient thing to do.” “What is the right thing to do?” Second, I try to focus on excellence in everything that I and the team that I lead undertake. I like to say, “If it isn’t perfect, make it better.” Third, I believe that we should treat others the way we would want them to treat us. And finally, when I know that I’m right, I never give up. I wish you the best of luck as you continue in your efforts to improve access to healthy foods in Delaware. You are truly finding a way to “pay it forward,” as First Lady Michelle Obama suggested. Please do not hesitate to contact me in the future about other matters of importance to you. Keep up the good work! That was a wonderful letter from Senator Carper. I am very pleased that he wrote to you about Brae’s Brown Bags and let you know how impressed he is with the success you have had with this project. Keep moving forward, I will always follow your lead. Hi Braeden…it was good of Mr. Carper to write to you…and good of you to keep him posted about your project. You are both public servants. God bless you. Aunt Gerri. That is amazing! I love that he had the chance to meet you and see what an amazing kiddo you are!